On the other hand, if your symptoms only occur at specific times or in certain places, allergies are most likely to blame. Pollen counts are highest around midday, so if allergies are to blame, your symptoms could worsen between lunch and dinner, especially if you are outside during that time or have the windows open. Many different allergens are responsible for triggering fall allergy symptoms. Ragweed is the main culprit, especially in Florida where the warm weather extends well into October and November. A single ragweed plant produces up to 1 billion grains of pollen for season! Ragweed pollen can even travel hundreds of miles in the wind to cause more trouble. 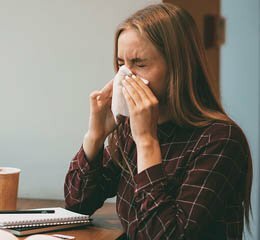 If your symptoms align with the release of ragweed pollen, then your sneezing, coughing, congestion, and itchy eyes could be a result of allergies, not the common cold. Is There a Fever Involved? Fever is one symptom that can help you eliminate allergies as a possibility. A fever usually occurs with an infection, so if your symptoms include a fever, allergies probably aren’t to blame. Some infections can heal with time and rest, but others need the attention of a physician. If your deductive reasoning points to allergies as the cause of your troubling symptoms, call (813) 670-7062 to make an appointment at Kratz Allergy & Asthma in Odessa or Port Richey, Florida. Dr. Kratz specializes in adult and pediatric allergy and immunology, so he can resolve your worst allergy problems and help you enjoy autumn once again.